Power Reel by John Kennedy Make silks, handkerchiefs, napkins and scarves fly around the room like ghosts! The Power Reel pulls in 80 feet (24 meters) of thread! Hummingbird Reel by John Kennedy Make silks, dollar bills, etc. fly across the room with the world's smallest electronic reel! Mystery Box by John Kennedy One of the best pieces of magic ever invented. Highly recommended! Impossible Matrix by John Kennedy Make three coins travel mysteriously one at a time underneath two playing cards. Acrobatic Matches by John Kennedy A matchbox flips over on your hand, then the drawer slides open and a match jumps out and stands on the box! Flight Deck by John Kennedy Cover any glass with a deck of cards. Toss a coin toward the glass - it disappears and visually materializes with a loud clink inside the glass! John Kennedy's Card Thru Window You will love performing this stunner. Card through window. Audience through roof. 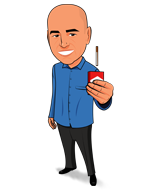 Animated Self Lighting Cigarette by John Kennedy One of the most amazing cigarette tricks ever imagined.